When you’re buying any bathtub, knowing the size of the tub is essential – we need to know how much space is needed in the bathroom in order to install it. Knowing what are the dimension of a walk-in tub (width x length x height) is even more important in order to appropriate movement space for our elderly, calculate how much space we’ll leave in the bathroom for a potential wheelchair and, simply put, because choosing the wrong walk-in tub dimensions can result in thousands of dollars in return fees and re-installations. Do walk-in bathtubs come in different sizes? Of course. 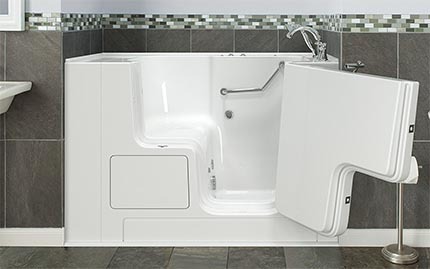 There are several different dimensions of walk-in tubs to choose from and we’ll list 7 most common (and uncommon) ones. One thing everybody is aware of is that a walk-in tub for senior costs, on average, $5,000 to $7,000 with the installation. Choosing the right size of the walk-in bathtub does spare a whole lot of problems down the line. A standard walk-in tub is 52” long and 30-32” wide (standard-size tub by American Standard). Below you’ll see exactly what kind of the walk-in tub dimensions are available. You should check all the sizes, from the small ones to the big double-seat accessible tub dimensions, to see which one fits your bathroom the best. If you haven’t yet measured the space in the bathroom for the walk-in tub placement, now would be the time. Width: the same for standard and walk-in tub. Length: walk-in bathtubs are shorter. 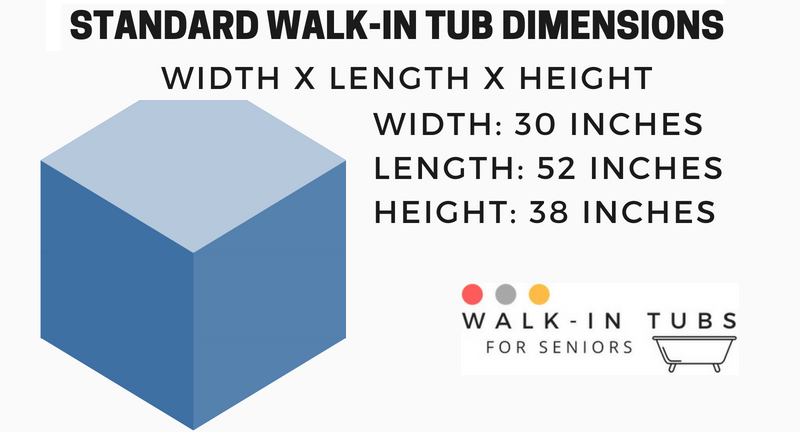 Height: walk-in tubs for seniors are higher/taller. A standard bathtub is 60 inches long and about 30-32 inches wide. No one really talks about the height of a standard tub; however, in the case of walk-in bathtubs, height is significant – these special safety tubs can be up to 50 inches tall and can hold up to 100 gallons of water. 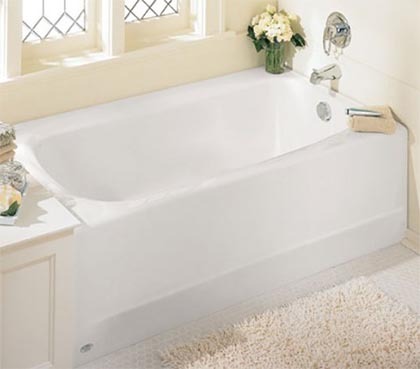 A traditional tub is 60” long and 30-32” wide (standard-size tub by American Standard). In contrast, the standard walk-in bathtub length is 52 inches while the width is the same as with standard tubs – 30-32 inches. The longest walk-in tub can reach up to 60 inches and some bariatric tubs (for seniors over 300 pounds) can be 40 inches wide. The smallest tubs for small bathrooms can be as little as 36.5” x 33.5” according to WalkInTubGuide with a height of fewer than 30 inches. Tip: Pretty much any walk-in bathtub can be installed in place of a traditional tub because the walk-in models are shorter (60” or less). 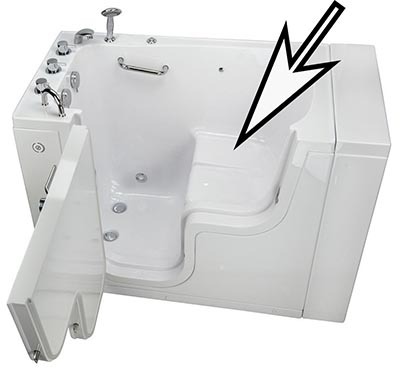 Walk-in tub seat width and height. The height of step-in threshold. The built-in seat should be of appropriate width and height for a comfortable bath. 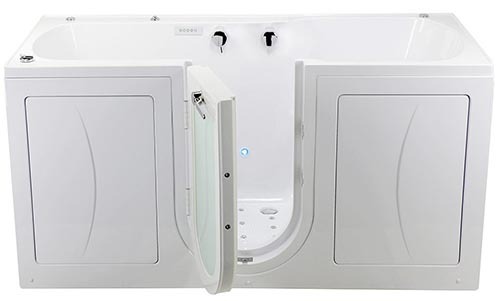 One of the main features of walk-in tubs is a built-in seat (some tubs come without the built-in seat). This enables elderly people to sit comfortably and enjoy a bath. However, in order for an experience to be truly enjoyable, the seat has to be of appropriate width and height. The standard size of seat we find in a walk-in bathtub is around 21 inches wide and has a height (distance from the bottom of the tub) of 17 inches. This seat size accommodates everybody with an exception of very tall or short seniors, or people who weight more than 300 lbs. For taller or shorter elderly people, the seat height of 17 inches might not be perfect. 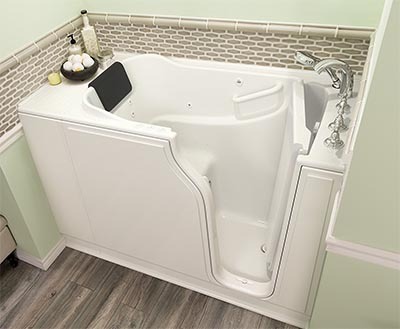 There is not much wiggle space as far as the seat height is concerned but you’re welcome to contact a tub distribution and talk to them about the walk-in tub seat dimensions. There are changes that you’ll be offered a 2 inch higher or lower (depending if you’re tall or short) seat. For everybody who is heavier than 300 lbs, chances are the walk-in tub seat will be too narrow. For heavier people, wider bariatric walk-in tubs were designed. Instead of standard 30-32 walk-in tub width, the bariatric models are around 40 inches wide and come with a 30-inch wide bariatric walk-in tub seat. Down below you can check the dimensions of bariatric walk-in bathtubs. The most common one is the narrow door. However, if you have a wheelchair or are a caregiver to someone who uses a wheelchair for their daily activities, the wider wheelchair accessible door is a better option. There a middle option as well. Some normal tubs and most bariatric walk-in bathtubs have a specific door that is narrow below and grows wider at the top. Generally, these are the easiest to use to access a walk-in bathtub. Of course, this is one of the most important walk-in tub dimension. The whole point of walk-in tubs is that a person entering it doesn’t need to awkwardly lift their leg over into the tub – instead, you can just step into the tub (hence the name ‘walk-in tubs’). However, to enter the accessible tub, we have to step over the threshold which is significantly lower. A general rule of thumb is that the lower the threshold is the better, especially for elderly people. Because there is such a variety of walk-in tubs with different dimensions, we created a list of 7 most common walk-in tub sizes and some that are uncommon such as cube walk-in tubs and two-seat walk-in tubs. The format used to indicate the dimensions will be: width x length x (possibly) height, all the numbers are in inches. As we’ve discussed before, the length of 52 inches and width of 30-32 inches is the golden standard when it comes to walk-in tub dimensions. 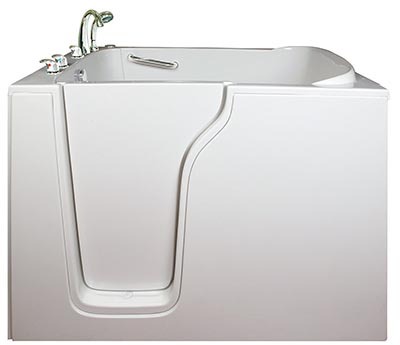 The standard height the standard tub reaches is 38 inches, which gives you about 30 inches of water depth. What this means is that when you seat in the tub, the water fully covers you up to the neck. This most popular dimension for a walk-in tub has a seat with a roughly 21 inches width – more than enough for most elderly. Standard-sized tub with a narrow door and air jets. For tall people (over 6 ft.), the standard-sized tub might just not be deep enough. The width and length dimensions of the deep soaking tub are the same as with a standard one, the height, however, is increased from 38” to 46”. These 8 additional inches is the difference between water reaching up to the neck instead to up to the chest. If the depth wouldn’t be increased, taller people would have to leave their shoulders and upper parts of their arms out of the water which isn’t as comfortable as being fully immersed in hot water. For people who are heavier than 300 lbs, the standard walk-in tub dimensions might not be optimal. This is why bariatric tubs were designed that are generally the same as the standard tubs albeit being considerably wider with a wider built-in chair. The extra-wide 41” tub by Ella Bubbles comes with a 30.5” wide seat. Standard tubs are usually 60” long and, in general, walk-in tubs are shorter – 52”. However, if you want a longer accessible bathtub, you’ll easily find one that is 60” long. These tubs are considered walk-in bathtubs for a large bathroom but given that it is only 6 inches longer, you can install it without much problems in a regular-sized bathroom. Nonetheless, it would be wise to first test such a long walk-in bathtub and check if you feel comfortable sitting in one. What one has to remember is that walk-in tubs are made for seating and don’t have to be as long as regular bathtubs where you can mostly lie down horizontally. 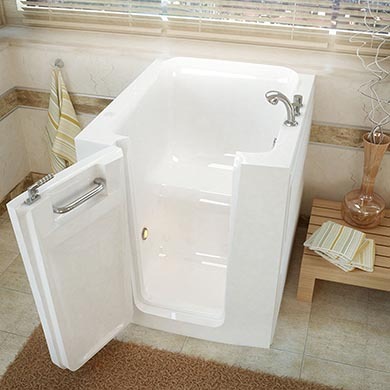 One of the biggest available dimensions for a walk-in tub is the 36 inches wide and 60 inches long bathtub. Of course, with such a big tub, you’ll have to figure out where to put it. That’s why this is the most viable option for seniors who have big bathrooms. What is worth remembering is that long and wide walk-in tub is one of the few accessibility tubs that are bigger than an ordinary bathtub. If you have a regular tub already installed and want to upgrade it to this big version of a walk-in bathtub, you’ll have to think about expending the space that is intended for a bathtub in your bathroom. In turn, this will mean you’ll have less free space to move around the bathroom. In a bigger bathroom this usually isn’t a problem, but with the standard-sized or smaller bathroom having a big walk-in bathtub is a less viable option. The smallest walk-in bathtub is cube-shaped, perfect for small bathrooms. Being only 38” long, the rectangular walk-in tub requires the least amount of bathroom space. What is more, it can perfectly fit into a corner that you just might not be using. The seat is of standard width; however, be sure to test how the small walk-in tub dimensions fit you. The cube tub is the shortest of all tubs and you might have problems with where to put your feet. Some seniors can experience a similar claustrophobic feeling you might feel on an overbooked plane with little foot space. You can easily take the measurements and plan where in the bathroom to put it but in order to ensure you’ll have a great experience, it is very important to test the rectangular walk-in tub first. What about if two seniors want to take a relaxing bath together? With one of the biggest walk-in tubs – the two-seater – this is no more a problem. The biggest walk-in bathtub for 2 persons is 80” long. As you can see, the biggest walk-in tub is 20” longer than a standard bathtub, and 4” wider. If you look at different tub sizes, this is one of the biggest tubs of any kind. When thinking about where to put this model, be aware that it is much bigger than your existing bathtub. You’ll have to find a lot of space to accommodate it but if you want to share your bath with your spouse, we hope you’ll find the space. To sum it all, it is important to measure the bathroom and figure out a walk-in tub of what dimensions you can safely place in your home. Of course, do consider how you’re going to move around the bathroom as well – especially if you’re choosing a bigger walk-in tub. Don’t forget that you’ll have to pick a place in the bathroom that is well connected as far as piping and, in case you’ve decided for a sophisticated model, electricity is concerned. It is nigh impossible to install a walk-in tub across the room from the piping, regardless of the dimensions. If you have an experience about how best to pick the dimensions of walk-in bathtubs, you can share it in the comments below. Whilst all efforts are made to present accurate information, the information accessible on this site may not be fully accurate or complete. You hereby concede that any and all reliance upon content or information accessed from this website is done so at your sole risk.